Whenever I think of fish tacos, I remember eating them in San Diego, when we met a friend for dinner by the pier. The place was so crowded and noisy that we were almost certain we wouldn’t get a table, but we squeezed between the patrons and managed to find a place to sit. Salty air blew through the windows from the ocean, and the light changed gradually as the sun set outside. I had a great time. It was the perfect place to eat a fish taco. So it’s a pity that the tacos themselves were pretty forgettable. Fried and battered fish fillets, probably with lots of shredded cabbage, tomato, and sour cream. Nothing special. But these fish tacos, homemade in Maryland? They’re so much better. They’re everything the San Diego tacos should have been. 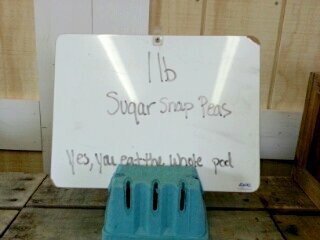 And when I eat them, they taste like summer and sunshine. These fish pieces are baked, not fried; however, because they’re individually dredged in flour, they still have a nice dry outer shell. (That was K’s idea; I was just going to broil fish and slice it after. This took a little extra time, but it works so much better.) We didn’t have cabbage and tomatoes aren’t in season, but we used pickled vegetables for crunch (another of K’s brilliant brainwaves) and red bell pepper for color. The result is colorful, delicious, and perfect for summer. Prepare a shallow bowl of equal parts flour and cornstarch. 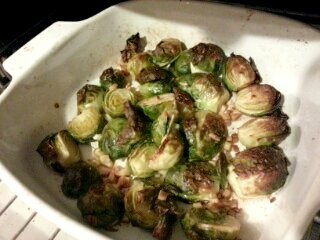 If you want, season this with a little cayenne pepper. In the oven, position a rack about 12″ underneath the broiler element, and set the broiler to HI. Cover a cookie sheet with tinfoil and oil it lightly. Cut each tilapia fillet in half lengthwise, then slice it into strips, working against the grain where possible. Dredge these strips in the flour mixture, then lay them on the prepared baking sheet. Sprinkle some salt and pepper over the strips, and drizzle with lemon juice. Stick the pan underneath the broiler until the fish are done. I just break one apart to see if it’s cooked inside. The outsides will be crispy, and the insides will be white and firm. It won’t take long. 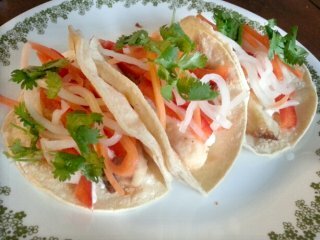 To assemble a fish taco: layer fish strips, bell pepper, pickled vegetables, cilantro, and sour cream into a tortilla in whatever order you like. Finish with a squeeze of lemon juice. Enjoy. The people at Breezy Willow have been working on an addition to their CSA shed for months, and this week it finally got its grand opening. It’s screened on three sides, so the beautiful fresh air flows in, and it’s big and airy, so there’s plenty of room to circle around and collect veggies, without having to wait outside while the people inside finish up. I love it. It’ll be beautiful in the summer. Maybe a little chilly in late autumn, but we’ll all be bundled up in coats and scarves anyway. 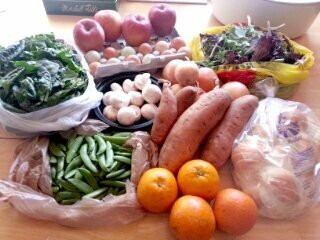 This week’s pickup: sweet potatoes, onions, oranges, zucchini, radishes, spring mix, spinach, green beans, garlic, and bread (Great Harvest whole wheat). This was a “bonus item” week, so we could pick from preserves or cheese (or ask for eggs if we really wanted them). I was tempted by the cherry amaretto jam but I went with “strawberry fields”. It’s spring and I’m really looking forward to strawberry picking. The oranges are a real treat, since citrus has been kind of scant this spring. In past years we used to get huge bags of citrus every week, but now the occasional orange or grapefruit is a nice surprise. It seems there was unpredictable weather in Florida and the citrus crop suffered as a result. 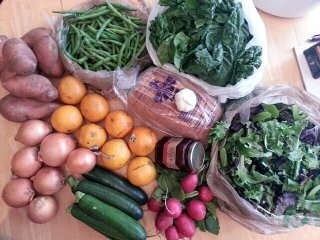 Thank goodness Breezy Willow CSA is a co-op and other farms could step in to pick up the slack. I also picked up some sheep’s cheese to try. 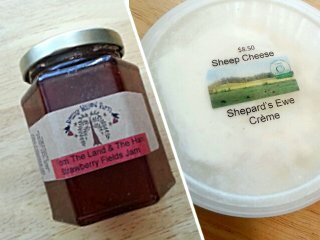 This is from Shepherd’s Manor Creamery (though now I’m unsure as to whether their name should be “Shepard”, or whether the label is mispelled). RJ’s been talking up the cheese in the weekly email bulletins, so I figured I’d try it. It looks spreadable, like cream cheese. I’ll let you know what I think. Though for $8.50 per small tub, let’s hope I don’t get addicted. Also this coming weekend, Savage Mill (always one of my favorite places to hang out) is hosting their Cherrybration and sidewalk sale. Hopefully the weather stays nice! On the table for CSA week 7 (which was last week, I’m trying to get it down before this week’s CSA comes along): Beets with lovely bright greens, spinach, mixed salad greens, green beans, zucchini, grapefruit, mushrooms, eggs, red potatoes, and bread (Great Harvest sourdough). The spring mix and the zucchinis got eaten right away. The spring mix from last week had gone kind of slimy and brown around the edges before we got around to eating it, and I had to throw away about a third of it. 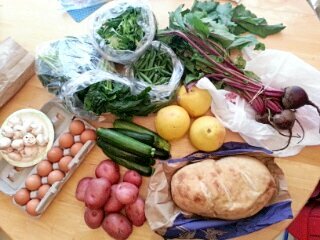 We’ve learned our lesson: if we get salad greens, we’re eating dinner salads on CSA day! As for the zucchinis, one got sliced and baked in the toaster oven for a quick side, and the others became part of a pasta dish with some Italian sausage. The spinach and mushrooms went into an omelet. The green beans got blanched and served as a side dish. Still haven’t used the beets or their greens, but I just checked on them and they still look good. So that’s all the quick perishables taken care of. 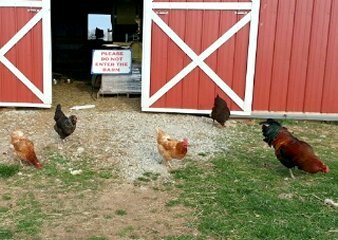 When I showed up at the farm for the pickup last week, the chickens were out and pecking around. Per posted instructions, I did not enter the barn, but they looked so content that I had to snap a picture. Now that’s what “free range” is supposed to look like. It does make me a little nervous when I see them meandering close to the cars, but in the almost five (!) years that I’ve been going to this CSA, I haven’t heard of one being run over yet, so they must have more in the way of self-preservation instincts than I give them credit for. I think I’m going to call this the year of the bean sprout. I remember one summer we had green beans from the CSA almost every week, until I was sick of beans and out of bean puns (has-bean, bean there done that, etc). 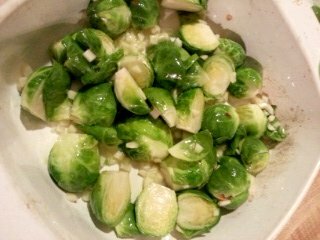 Finally a friend suggested just blanching and freezing them whenever they showed up. It restored my sanity, not having to eat green beans all the time. This year, it’s bean sprouts, week after week. Good thing we’re in the middle of a good bout of stir-fry weather. When it’s hot outside, no one wants to stand over a hot stove, simmering something for hours. Let’s get the pan hot, cook something quick, and retreat back to where it’s cool. 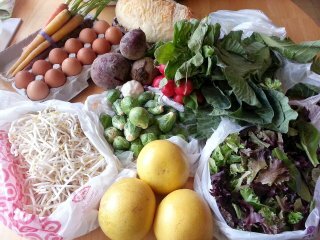 Week 6 of the spring CSA: bean sprouts, Brussels sprouts, a head of garlic, beets, beautiful red radishes, collard greens, mixed greens, grapefruit, rainbow carrots, eggs, and bread (Great Harvest parmesan sourdough). Actually I’ve never cooked collards before, but I’m told they’re very similar to kale. Maybe I’ll make colcannon (thanks to AnnieRie, I now know that you can make colcannon with more than just kale and scallions). Or maybe I’ll go leafing (hah!) through the Lee Bros cookbook, considering they’re Southerners and collards are a Southern staple. I was reading an article recently – I don’t remember where – that lamented the fact that when we go shopping, we have an entire aisle of cereals to choose from, but head to the produce section and we get to choose between three types of apples, and if you want cauliflower or carrots, you get whatever the store happens to have. 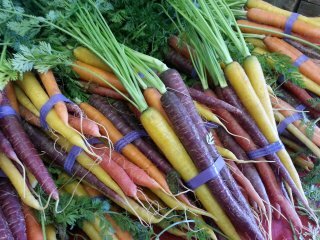 I was an adult before I knew that carrots came in jewel-toned colors, or that you could even grow purple or orange cauliflower. When I go to the farmer’s markets in the fall and see all the different kinds of winter squash, in all shapes and colors and textures, I’m like a kid in a candy store. If we filled a store with many different kinds of fruits and vegetables, how wonderful would that be? How many more people would fall in love with food? 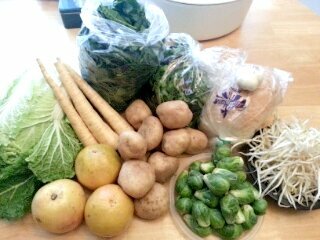 Anyway, we got spinach, sugar snap peas, apples, mushrooms onions, sweet potatoes, oranges, and more mixed greens. 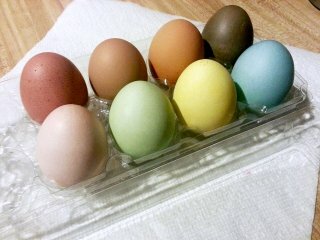 I got Breezy Willow eggs this time (hence the colors) and challah from Great Harvest. Looks like I get to make spinach and mushrooms again. I’m also thinking about roasting up some of these sweet potatoes and making a quickbread for the kid. He loves starches, and the more nutrition I can pack into bread form, the better. Apparently enough people were asking that they decided to put up a sign.